The Society to Preserve Indigenous Rights and Indigenous Treaties (S.P.I.R.I.T. )responds to racial profiling and injustice to people of color in Oklahoma. In response to the Kay County Sheriff's Department's desecration of a sacred eagle staff and their violation of a Mohawk citizen's civil and human rights, S.P.I.R.I.T. 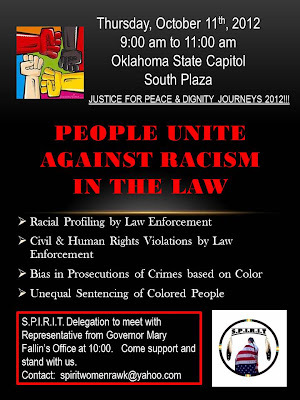 has confirmed a meeting with representatives of the Governor's Office to discuss Racial Profiling of Indigenous People in Oklahoma. 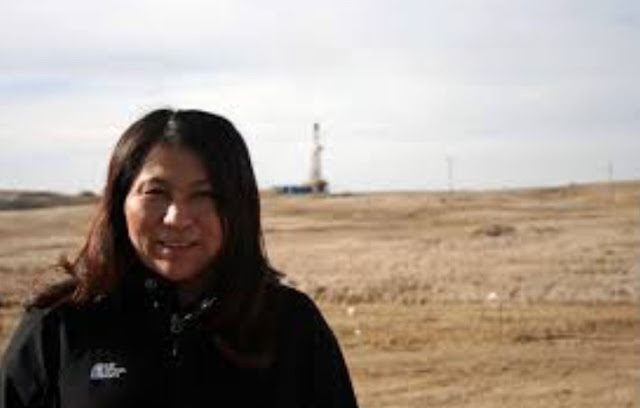 The Peace & Dignity Journeys' 2012 were our esteemed guests in Oklahoma and were stopped by police three times in four days for "looking suspicious". This is indicative of the racism people of color encounter in Oklahoma on a regular basis. We call upon everyone to stand together with voices united to show that we are not going to let this racism continue without pointing it out and attempting to make change. “Would the police have stopped a runner carrying an Olympic torch?” asks David Hill (Choctaw), “or how about that guy that ran along the interstate carrying a cross, why wasn’t he harassed?” “Making a Native American put a sacred eagle staff on the ground is akin to pouring holy water out on unhallowed ground” says Brenda Golden. Oklahoma ranks 2nd in the nation for having the most Native American residents, this type insensitivity is uncalled for and was totally based on bias. “With 7 native nations in and around Kay County for over 100 years, surely the local law enforcement agencies can be expected to have some knowledge of native culture. Our traditions and religion are equally revered and our sacred objects esteemed as any religion,” says Dwain Camp, Ponca Elder. The delegates that will meet with the representative of the Governor's office are: Marilyn Yarbrough, Brenda Golden, Jeri Ligett, David Narcomey, Stella Dyer Long, Tafv Tahdinooappiah. Jeffrey Cantmell of the Assistant General Counsel for Governor Mary Fallin and the Director of Cultural Affairs for Governor Mary Fallin will meet with S.P.I.R.I.T. delegates. S.P.I.R.I.T. attempted numerous times to contact the Tribal Liaison to the Oklahoma State Governor, Kay Hensley, without success, e-mails and phone messages were left unanswered. S.P.I.R.I.T. hopes to use this opportunity to increase awareness of the racism prevalent in the law enforcement and justice systems in Oklahoma. Racial profiling and inequality of treatment by police and law enforcement is a wide spread problem for people of color in Oklahoma. S.P.I.R.I.T. has invited the Oklahoma State Chapter of the NAACP, the Oklahoma City Chapter of the NAACP, LULAC and the Latino Community Development Agency to support us in making our concerns known. We call upon members of the community to join us in bringing justice to the Peace & Dignity Journeys 2012!